Contestants name, age at time of submission & contact info (email & phone number). Incomplete entries may be discarded without notice. Please be sure you include all entry information. Entrants submitted photo’s may be used in promotional materials in print, online, social media sites, video or otherwise. Winner’s photo’s and first name, age, chosen school or non profit will be used in promotions in print, online, social media sites, video or otherwise. Winners will be chosen at random from each age group. The winner of each age group will receive a $50 Hugo’s Family Marketplace Gift Card and a $500 donation will be made by Hugo’s in your name to the school or non-profit (501C3) you selected with your entry. Contest runs 3/21/19 to 4/21/19. Winners will be posted 4/25/19. For a complete list of winners, check the Hugo’s Family Marketplace Facebook page after the contest has ended. 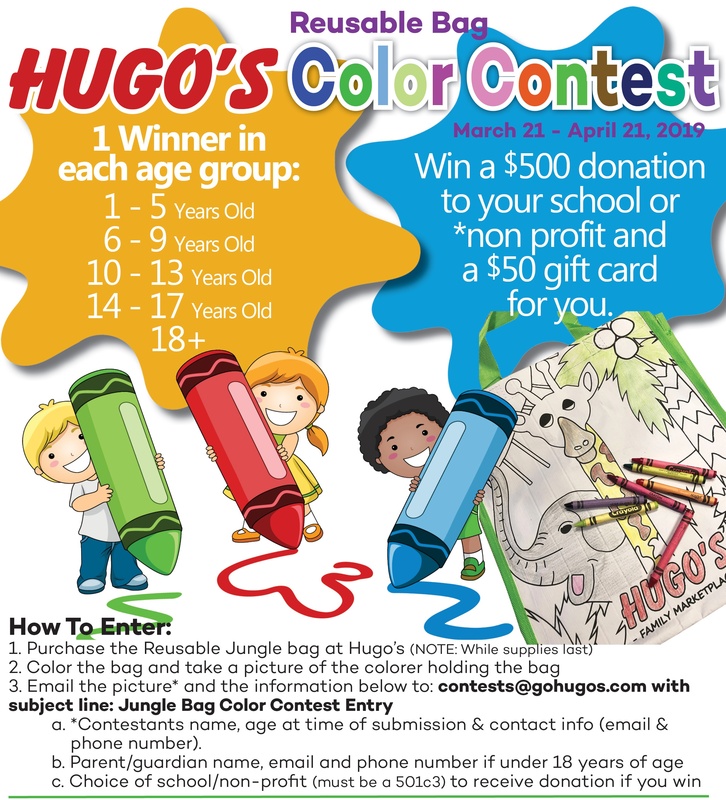 By entering a contest submission to contests@gohugos.com, you agree to all rules and regulations of the contest.